To coincide with the (Australian) release of Madman Entertainment’s Special Edition of Transformers the (animated) Movie and their 17-disc Complete Collection of the entire G1 animated Transformers series (click on the pack image below), a special all-Transformers edition of their podcast, Anime Snacktime, is now available for download. The podcast, in amongst a bunch of other great stuff, features an extended interview with yours truly, in which I discuss, well, just about everything… including my Transformers work past, present and future. 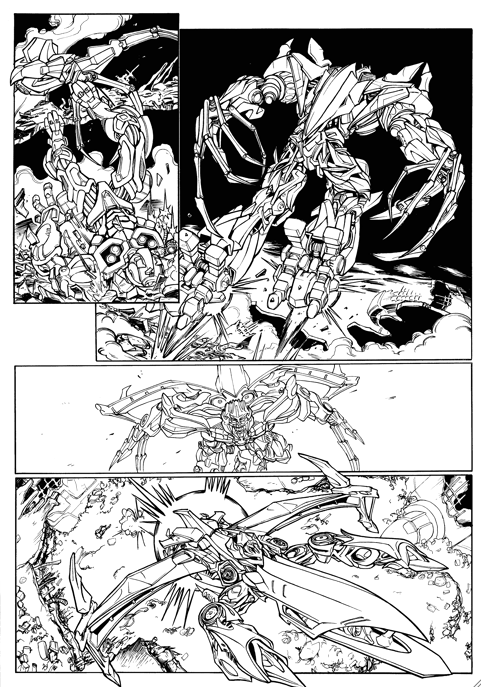 There’s also a good bit of exclusive background on the creation of the mini-comic (available only with the Complete Collection) I did recently with artist Nick Roche (see previous blog entry for details and art). So, if you’d like to listen to my dulcet tones, head to Madman’s dedicated Transformers site here or the home of Anime Snacktime here. Any questions raised by (any part of) the interview, feel free to discuss them right here on my blog by clicking on the ‘comment’ option of this item. I’ll do my best to answer as many of them as I can. Just a reminder that this week (Wednesday 27th in the US, Thursday 28th here in the UK) sees the release of Transformers Spotlight: Galvatron, written by me and drawn by Guido Guidi (oh, and published by IDW). Different this one, largely because instead simply re-presenting a character with a distinctive IDW-verse twist, this is a complete reinvention of the ‘classic’ G1 character. Originally, Galvatron (as all fans of the original animated movie know) was the future version of Megatron, recreated by Unicron from the shattered remains of the former Decepticon leader. However, this Galvatron is NOT IDW Megatron in a new body. In fact, he pre-dates IDW Megatron (currently strutting his formative stuff in the excellent Megatron: Origin series) by some way. It’s all connected to the mystery of the first Ark (as mentioned in Spotlight: Nightbeat) and its crew. How? Well, you’ll have to check out the issue to find (some of, anyway) the answers. Oh, and for those who like to know where this issue fits into the grand scheme of things, it sits between the end of Escalation and the beginning of Devastation. Essential reading if you want the whole big picture. 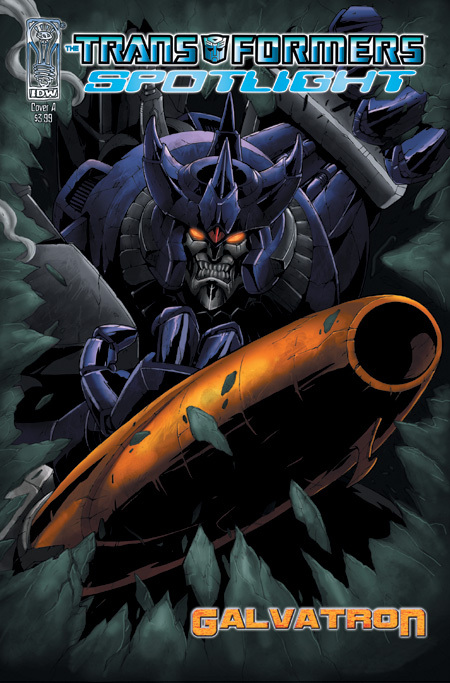 Click on the cover thumbnail below to see Guido’s reimagined Galvatron and check out the IDW site here for more information on all current and upcoming releases. Finally! I’ve seen it. The new (live action, summer blockbuster) Transformers movie. There’s an embargo on reviews (as such) until July 1st, so I’m going to dodge and weave a bit around full on opinions, and anyway, my review is destined for July’s issue of Comics International (#203). One thing I will say is that it’s a real adrenaline rush of a movie, and that lovers of action movies that assault the senses on every level will not be disappointed. And the stars of the show, the robots themselves, are nothing short of amazing! My gob was well and truly smacked as they so completely came to life on the big screen. I do have reservations, but as a widescreen cinematic experience it simply shouldn’t be missed. Click on/download the Word file below for extracts from my review (first) and the accompanying feature on Transformers in comics (from 1984 to the present day), both of which appear in full in the aforementioned Comics International #203 (available from all good comic shops). Enjoy! 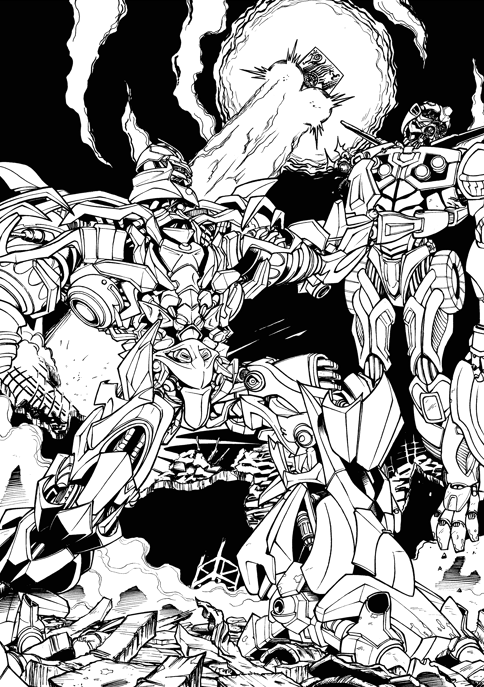 Thanks to the good people at Titan Magazines, we have first look at Nick Roche’s stunning art from issue #2 of the Transformers UK comic/magazine. The story, written by me and featuring movie Megatron, laces into (and out of) the IDW movie prequel comic/series, exploring the very beginnings of Megatron’s quest to find the Allspark (after being waylaid by Bumblebee). Click on the thumbnails below to view the art. Issue #2 hits stores on the 16th August (issue #1 on July 19th), and for more information and subscription details, go here. As promised, here’s the second of this week’s script (w)raps, my rambling disgressions on Transformers Devastation #3. As always, these are teasers rather than spoilers, but boy does it get tougher as a series progresses not to give away crucial plot details. I need to remember that as of yet no one’s even seen #1, and dole out my revelations (hm. Isn’t that the next series?) sparingly. So, what’s going on? Well, this is more a fallout kind of issue, as the tumultuous events of the previous two issues settle into a kind of shellshocked aftermath. Not that the issue is short on action and surprises, quite the opposite. 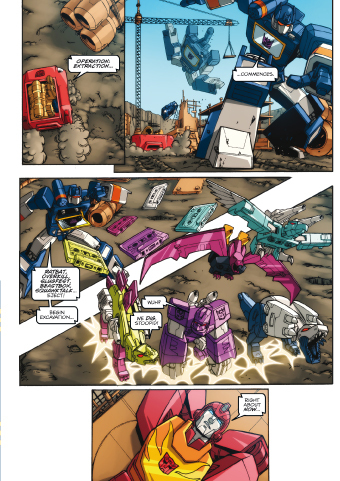 Sixshot does his, er, worst to tie up a loose end in the shape of Ratchet (and Verity and Jimmy), within the Machination’s Florida hub, Hunter is faced with a shocking request (courtesy of Sunstreaker) and Hot Rod and Wheeljack face a twin dilemma, the Headmasters and… well, wait and see. It’s what you might call a ‘crushing’ deadline. Once more ‘doc’ Ratchet finds himself at the sharp end of things, but this time it’s a planet-smashing living weapon he’s facing. No contest, I’m afraid. Oh, and a few more sub-plots bubble along: General Deacon and Senator Holt (from Escalation #2) make a reappearance, the Reapers step up into the limelight and the forces of the Dead Universe make their own moves. All this in 22-pages? What I call a value-for-money issue. It’s out in November! Don’t miss it. 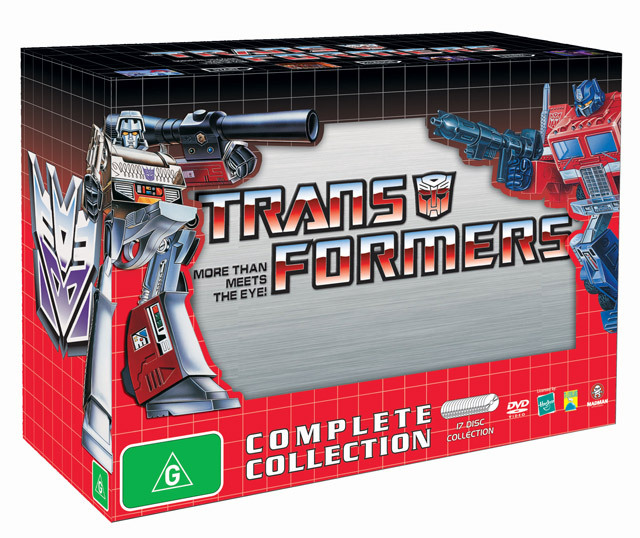 Madman, purveyors of Transformers DVDs and apparel down under, are set to release (on June 27) not only their Special Edition of the Transformers (animated) movie but also their Transformers The Complete Collection DVD boxset (featuring the entire G1 animated TV series on 17 discs in a special edition box). The latter release comes complete with an exclusive comic, featuring an all-new strip set between the end of Season 2 and the beginning of Transformers The Movie. Written by myself, with breathtaking art from Nick Roche, the comic harks back to both the original animated series (in style and content) and also the look and feel of the original Marvel UK comic (both Nick and I viewed it as something of a homage to that bygone age). Click on the thumbnail below for a sampler from the story. For more details of the Complete Collection and Animated Movie Special Edition, check out the Madman site here. A few items of possible interest concerning the (rapidly) upcoming Transformers movie. First, I’ll be reviewing the movie for Comics International (issue #203, on sale in July sometime). This is, of course, contingent on my actually seeing the movie, but the omens are good for a preview screening sometime this week. The review will go hand in hand with a feature I’ve already written for that selfsame issue of Comics International, concerning the movie itself and the evolution of Transformers in comics form (over the past twenty years or so). I’ll be publishing brief extracts from both review and feature here, in due course. Keep watching. Comics International is available from all good comic stores. Other stuff? Well, I’ve also (above and beyond the new comic stories) contributed some feature material for Titan’s new Transformers comic/magazine (click on the link below for a new promotional advertisement for the title). Issue #1 (on sale July 19th) features a profile on Optimus Prime and a head-to-head (battle profile) between Ratchet and Barricade. Issue #2 (on sale August 16th) features a Megatron profile and a Jazz/Blackout head-to-head. Oh, and if you like these, you should definitely check out the upcoming Transformers: The Movie Guide from Dorling Kindserley (yep, written by me). It features pretty much everything you need to know about the movie characters (robot and human), organizations (Sector 7, etc) and fixtures and fittings (Allspark and so on). It’s out on July 4th. You are currently browsing the simon furman blog archives for June, 2007.